1. Under the cover imbedding a fabric laceration resistant network. 2. Characteristic: high adhesive tension,increasing the cover tensile strength.Effectively preventing the external scratching and crushing, increasing the transverse tensile strength of conveyor belt and flexing resistance.Easy repairing with the strengthen of material impacting resistance. 1.Under the cover imbedding a steel mesh laceration resistant network. 2.Characteristic: high adhesive tension, increasing the cover tensile strength. Effectively preventing the external scratching and crushing, increasing the transverse tensile strength of conveyor belt and flexing resistance. Easy repairing with the strengthen of material impacting resistance. 1.Under the cover imbedding Induction coils, in the normal running, the coil generates electrical signals, and feedback to master station through the magnet. If there‘s scratching and crushing in the coil position， it would be starting the emergency stop device until the feedback signal raising the abnormal alarm. 2.Characteristic: Accurately and timely，the system can be used in the conveyor belt, can also be applied to joints, simple operation control. 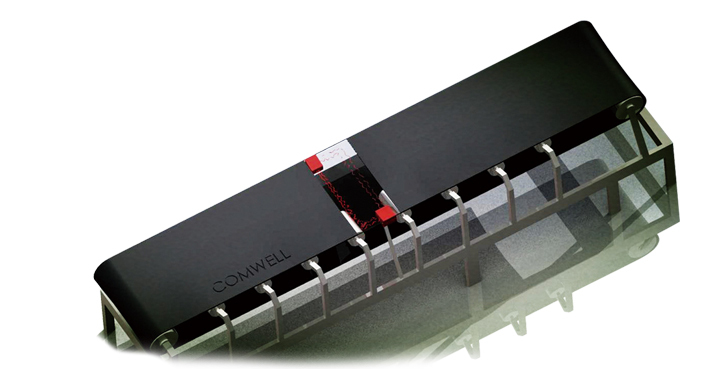 Long　service life for the embedded coil, also have certain physical protection for the longitudinal tearing, the coils embedded in the process of production , cost less but plays a big part in the main transmission protection ,it will start transmission system outage protection once the conveyor belt tearing，which can reduce the customers' loss . Application scope:1000-10000N/mm Width:1000-2200mm.